The Funky Felter: Going Green can be super fun! I never realized all the eco-friendly items available until today. Going Green can be super fun! I never realized all the eco-friendly items available until today. Recently, I was looking at fiber art related DIY kits on Etsy. 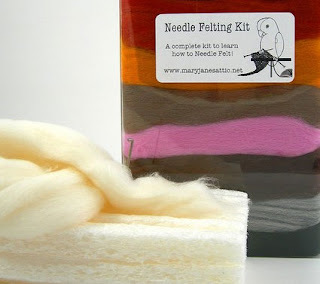 I found a really neat needle felting kit at Mary Jane's Attic which has a corn based eco-friendly foam pad. You can see it at the bottom of Mary Jane's Attic's photo above. How cool is that?! It is a very nice alternative to the polyurethane foam pads which are widely used. And, yes, I admit that is what I've been using for years. It has always been the most convenient thing to buy at my local hobby shop. Recently, I have been more conscious of "going green" in my daily life. I'm not a very trendy person so it is not about being trendy to me, but rather about conserving resources for the children that I'd like to have some day and also about saving money and energy in the long run. After finding that super cool eco-friendly foam pad, I did a Google search to see if I could find out more about it and its manufacturer. Although Mary Jane's Attic has terrific needle felting kits, I really don't need one at this point in my feltmaking journey (believe me, I have too much wool and too many needles stocked up already! ), but I was very intrigued by the foam pad itself. I only searched the internet for a few minutes and got side-tracked as usual, but I found an interesting site for eco-shopping called EcoShopper. When I came across EcoShopper.net, I had to stop and browse. It opened my eyes to all of the eco-friendly products out there that are available. It baffles my mind that there could be a laptop made with cedar wood. It is not only beautiful, but highly functional as well. Go to their site and check it out! You have to see it to believe it! I imagine that I will be exploring EcoShopper.net even more to see what other neat items I can find. And, I will continue my search for the eco-friendly foam pads eventually, but I'm having too much fun now getting side-tracked. Kudos to Mary Jane's Attic for being so eco-conscious with their DIY kits! You have introduced me to something new and valuable today. Thank you! I love MaryJanesAttic and TheFunkyFelter! This was a great article. I am faving ecoshopper.net That cedar laptop sounds too cool. Made by Moxie also sells a vegetable-based needle felting pad. There are none listed at the moment, but you can see it in her past sales: she sells it alone or in a kit.